The drive chain slack must be checked at the tightest point on the chain. Both wheels should be on the ground without a rider on the vehicle. 2. Turn the rear wheel several times and find the tightest position on the drive chain. Drive chain slack "a" Out of specification Adjust. Measure the drive chain slack halfway between the drive axle and the rear wheel axle. a. Loosen the wheel axle nut "1". b. Loosen both locknuts "2". 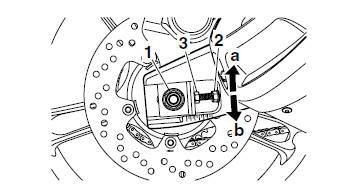 c. Turn both adjusting bolts "3" in direction "a" or "b" until the specified drive chain slack is obtained. Push the rear wheel forward to make sure there is no clearance between the drive chain pullers and the ends of the adjusting bolts. d. Tighten the wheel axle nut to specification. e. Tighten the locknuts to specification.